It's a bittersweet return home for Ragnar and company. Tired and battered the Vikings sail ashore to Kattegat. Athelstan entrances Ragnar with stories of his visit to Paris and the king hangs on every word. Floki from afar wonders what they could possibly be talking about. The one thing that is certain in 'The Usurper,' any and all secrets are revealed once they hit land. The writers of Vikings have set up this moment to expose the sins of everyone from Wessex to Kattegat. And it doesn't take long either from the time the weary warriors step off the boat. Sensing something was wrong Ragnar asks Aslaug where are the boys. Not even a 'hello' or 'I missed you.' Lagertha broke the news to both of Thorstein's baby mamas of his passing. The most heartbreaking was seeing Rollo call out to Siggy to which there was no reply, of course. Aslaug tells him she died while saving her boys on the frozen lake. Rollo is stunned and inconsolable. The revelation does bring some questions with it and most curious is Ragnar. He continues to ask why was Siggy watching his boys. The grief-stricken Rollo blames himself and drowns his sorrows in alcohol. Bjorn has to fight his uncle before someone else at the watering hole kills the belligerent drunk. 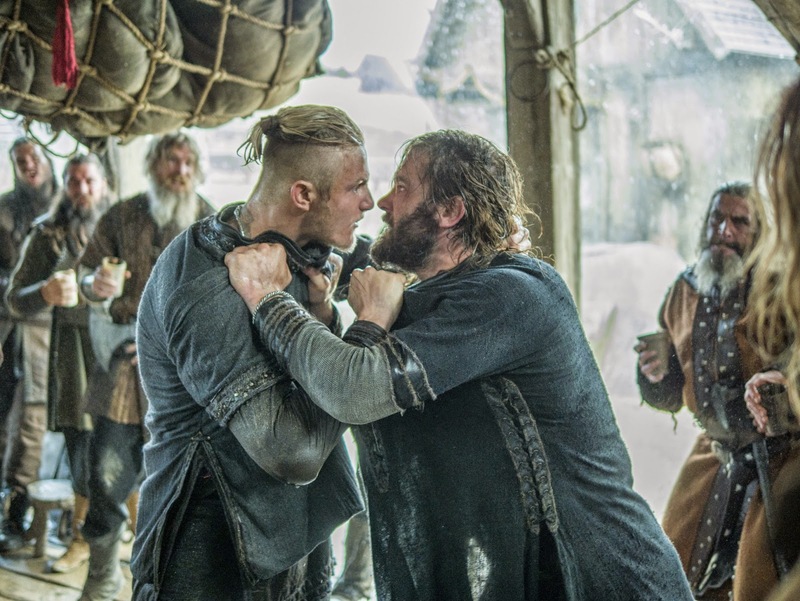 They go toe-to-toe, but Bjorn is too strong and sober for the lumbering Rollo. If he felt guilty for Siggy's death then he earned the penance he was looking for with a bloody beating. Later, a particularly amusing scene between Aslaug and Ragnar considering he's asking about Harbard. Helga spilled the beans to Floki about the wanderer's stay in town right down to bedding Aslaug. An enthralled Floki seemed to enjoy the news and when he heard the name he said he must have been a god. Helga reminds him people died, but he explained that death gives way to life. Aslaug just told Ragnar about the healing touch Harbard had with Ivar making him jealous. Of course, he picks up Ivar only to wake him and set him crying. She left out the part where she sleeps with the wanderer. Ragnar's obsession with Paris has him gung-ho to invade this magical place and makes its known to his people that's the goal. All thanks to Athelstan's influence which doesn't sit well with Floki. A messenger sends Lagertha some bad news. Kalf has taken over her Earldom and her lands. Lagertha is incensed but getting very little help or interest from Ragnar. She reminds him that she had his back. Some of the best interactions on the show have been between Travis Fimmel and Katheryn Winnick. Their chemistry and playing off one another is entertainment unto itself. Ragnar goes with her to confront Kalf but he's more interested in talking him into joining him on raiding Paris. Ragnar can be impetuous so this move is more about himself than helping Lagertha. The truth-telling continues back in Wessex as Judith reveals she's pregnant and Aethelwulf is understandably enraged. So much so he pulls an Anakin Skywalker and massacres a Viking village. It's a shocking and terrible scene as kids are running for their lives and King Ecbert's promise to Lagertha that they'd have his protection is blown asunder. Ecbert was appalled and outraged at the news of such slaughter. He pinned the blame on his noblemen for their treachery. The same guys who coincidently weren't too keen on the king's leadership. So the King got to show his people he's still very much in control of his kingdom. Behind the scenes Ecbert thanks his son for wiping out the Northmen. It turns out his rage wasn't just about his wife having someone else's baby but taking out his hate of the Northmen farmers. Ecbert had it all planned. So will the facade of placing the blame on his supposed treasonous men placate Ragnar and Lagertha when they find out? I would doubt it. No one fully trusted Ecbert. Everyone knew what he was capable of and it was a matter of when not if he would betray them. But will the Vikings deal with their fallen people first or will they go on to Paris? Will they see through Ecbert's excuses and take him on? After the season got off to a slow start, Vikings has really come full circle in the latest episode tying up plotlines and catapulting the drama to another level. It's easily the best episode thus far and only getting better. The mystical angle has subsided and good old-fashioned backstabbing and deception have taken front stage. The truth is out in the open for everyone to see and there will be hell to pay.